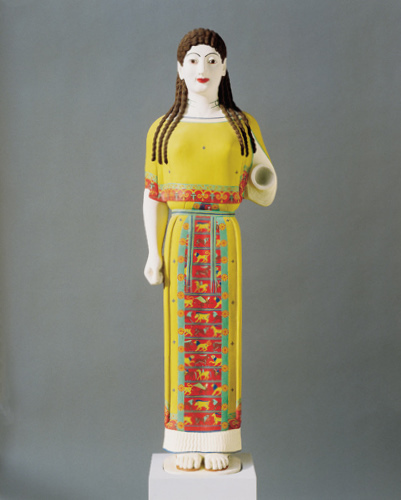 This current "un-peplos" argument is based on recent reconstructions and studies of the figurine. Instead of a peplos, it is thought that the statue is wearing a long robe, cape, and an ependytes (an outer garment which is a metal-like sheath divided into regular, rectangular compartments).1 The ependytes was an Eastern garment associated with divine power, and therefore suggests that this figurine would have represented some type of goddess, perhaps Artemis or Athena. I really like the animals shown on this ependytes, but I can't tell what if a mythological narrative is depicted in the reconstruction. I kind of doubt it. But if anyone wants to have a guess at what might be depicted, you can click here to see better details of this reconstruction. 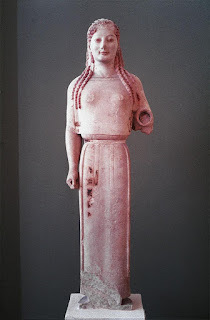 I don't know if we'll ever have a concrete idea of what this statue looked like in terms of color and the ependytes design. There just aren't enough paint samples for us to have a completely accurate reconstruction. 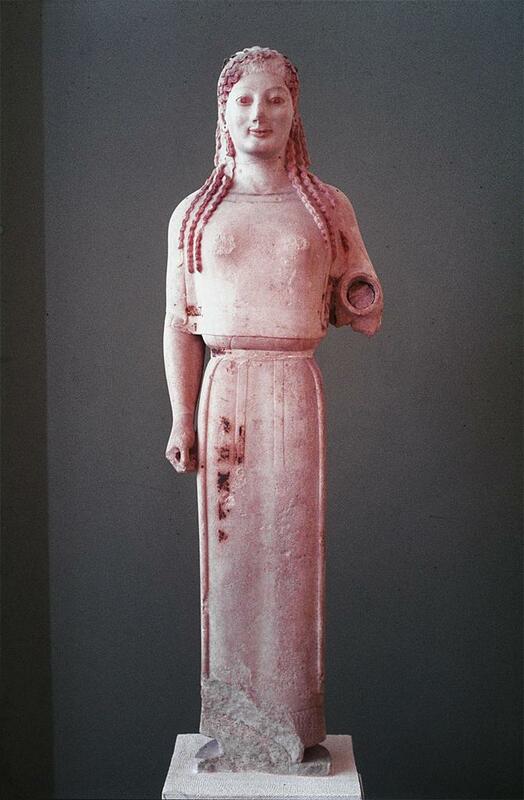 Plus, it will be hard to know specific details unless we ever come across the kore's missing arm/hand. But it's fun to think of the how this sculpture might have appeared (and who actually was represented!). 2 Ibid. You also can read an English review of Brinkmann's publication here (review by by Brunilde Sismondo Ridgway). Be sure to check out the penultimate paragraph and footnote #12 to find out more information about the Peplos Kore argument.